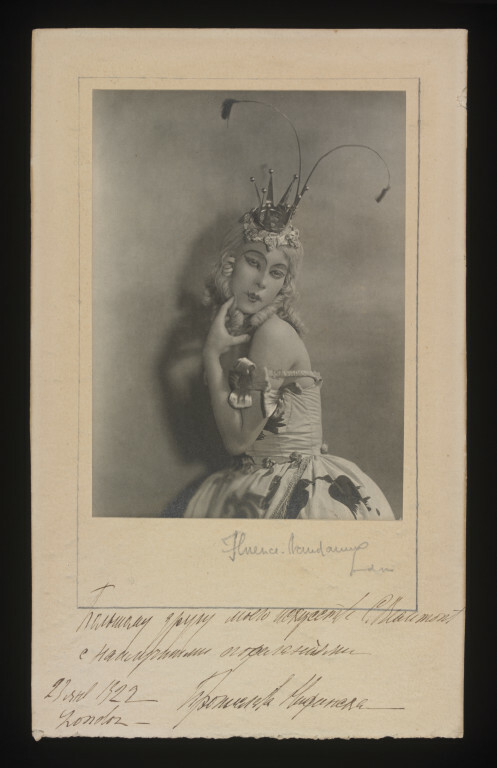 Bronislava Nijinska is shown in costume for Fairy Hummingbird of the Fairy of the Humming Birds in Serge Diaghilev's production of The Sleeping Princess for his Ballets Russes presented at the Alhambra Theatre, London 1921-22. 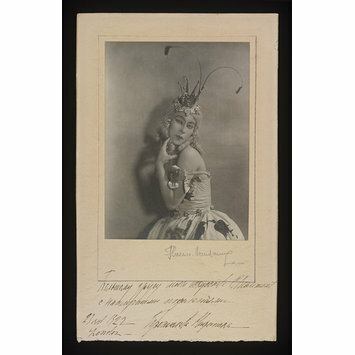 The Sleeping Princess with Marius Petipa's choreography staged by Nicolas Serguyev and additional choreography by Bronislava Nijinska, designed by Leon Bakst to music by Piotr Ilyich Tchaikovsky was mounted for Serge Diaghilev's Ballets Russes at the Alhambra Theatre, London on 2 November 1921. Portrait of a woman in theatrical costume. The photograph shows her side view but with her head turned to the camera. She wears a wig with ringlets on which is placed an elaborate crown with extending antennae and wears elaborate make-up. The strap of her costume on the shoulder of which is a flower falls down her arm and the decoration of birds can be seen on her skirt.